How to save America’s Parks: Pack ’em with people? The Old Curry Orchard, Yosemite N.P. Author photo. America’s national parks have never been so crowded, so trampled, and at the same time so deeply underfunded. Can’t we just leave them alone? The necessity of such a thing at this particular moment in history may be worth questioning. The fact is, whether it’s the recession, fluctuations in the value of the U.S. dollar, or what Yosemite videographer Steven Bumgardner calls “the Ken Burns effect,” or who knows what combination of factors, the parks are bracing themselves for the busiest summer in the history of the system, with upwards of 300 million customers expected by the end of 2010. More than 33 million viewers have watched at least one episode of “The National Parks: America’s Best Idea” (have you?). Who knows how many hundreds of millions more have seen the advertising in magazines, on TV, at gas stations and ATM machines nationwide. 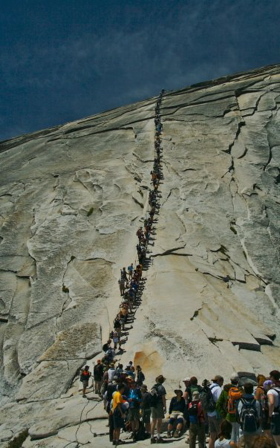 In 2009, Yosemite alone bore the weight of nearly 3.9 million pairs of mostly sensible shoes, with a quarter of a million cars entering the park just in the month of July. This year, for the first time in more than a decade, the number of visitors may clear 4 million. The short of it: business is booming for the handful of concessionaires who hold the contracts to rent beds and showers in the parks, and to sell burgers and pizza and cuddly, overpriced stuffed bears to the hoards. And Ed Abbey, meanwhile, his bones somewhere in the Cabeza Prieta desert of southern Arizona, is contorting in his sleeping bag. 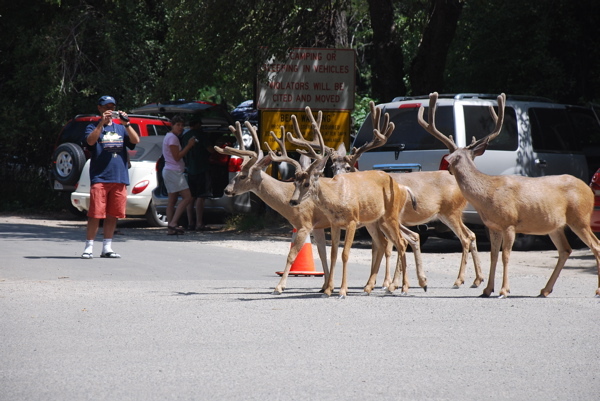 So again, I think we have to ask (before we can even begin to revisit Abbey’s notion of banning cars in the parks and instead giving every visitor a bicycle): do America’s National Parks really need an aggressive promotional campaign? Kenny Karst, the ever amiable P.R. manager for DNC Parks & Resorts at Yosemite, Inc. (DNC being the exclusive concessionaire for that park and all manner of other nodes of entertainment and recreation across the globe), points out that even McDonald’s and Coca-Cola continue hard-selling their products through good times and bad. PROMOTE, v. [from the compact OED on my desk, which I can barely read (the glass is upstairs above the fireplace)]: to further the growth, development, progress, or establishment of (anything), to further, advance, encourage. To further the sale of (an article) by advertising or other modes of publicity, to publicize. Some of which — i.e. to encourage — seems like a good idea, right? The rest maybe not so much. Or am I missing something? Are we trying to sell our national parks? Back to ourselves? From the beginning, park administrators have been saddled with the impossible task of, on the one hand, preserving these places in as pristine a state as possible, and on the other hand providing access to all citizens. This new promotional organization is broad-reaching, to be sure, with a board of directors “comprised of representatives of national park cooperative and friends associations, tourism/hospitality entities, state tourism offices, gateway communities, the National Park Service (in an ex-officio capacity) and others interested in national parks,” operating with “guidance from finance, research and marketing committees comprised of nationally respected persons.” Do they all truly have the park’s (and the people’s) best interests in mind? We hope so. As the author of a guidebook to Yosemite and Death Valley, and a forthcoming iPhone guide app, as a journalist trying to make a living writing about travel and adventure and land use in these sorts of places, I should perhaps be seeing dollar signs. As a local resident, I should be glad to think that one day my community — and my parks — might be sustained in a healthy way by more and more tourism. But I find I am wary.